Based on your knowledge of the unit circle, see how sinusoids (sine and cosine waves) get their shapes. Click the Start/Stop button. Notice how both the green arc along the unit circle and the green line segment along the x-axis always maintain the same lengths. Therefore, the x-coordinate of point P also represents the radian measure of the arc's central angle. This can also be viewed as "unwrapping" the arc and laying along the x-axis, starting from the origin. 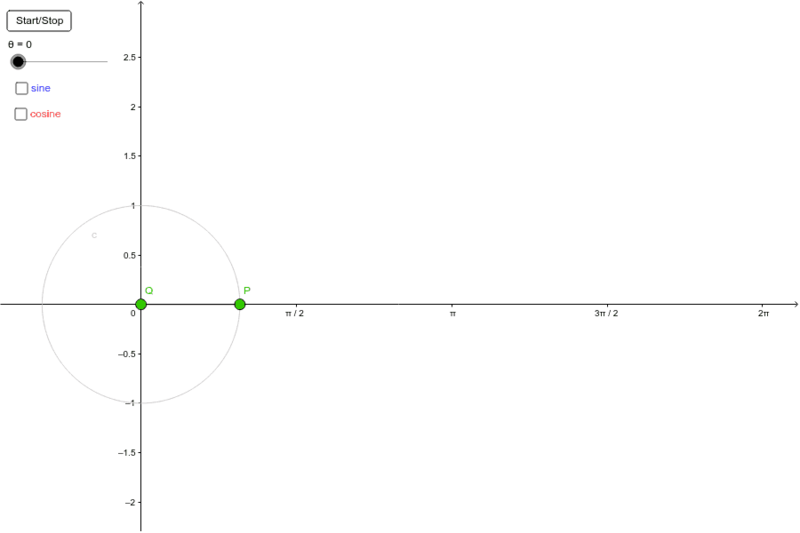 Click the checkbox for either sine or cosine and once again observe how the geometry displayed on the unit circle is also represented sliding along the x-axis. Click the trace checkbox to view the formation of a sinusoid.